Scorers: Orient; Taylor (11 pen), Chiedozie (60). West Ham Utd; Gary (og 27), Stewart (34 pen), Stewart (81). Orient: Rafter, Fisher, Roffey, Taylor (c), Gray, Moores, Chidozie, Hughton, Jennings, Mergerrison, Coates. West Ham United: Parkes, Lampard, Brush, Bonds (c), Martin, Devonshire, Allen, Pearson, Pike, Stewart, Neighbour. "Blunders in front of either goal presented it in the end to the better organised team"
An unbiased press comment such as that might not have aligned itself with everyones views of our FA Cup victory against Orient, but there was a certain amount of logic in it. The five goals were a very mixed bunch, consisting of two penalties, an own goal and two of the better-aimed shots of a game; it eventually bought satisfaction to the Hammers in the form of a place in the last sixteen. 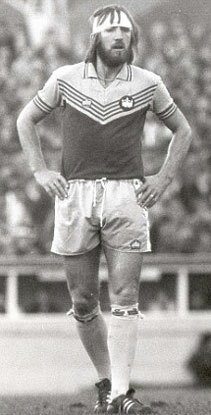 Billy Bonds' determination to play in the tie was emphasised when he took the field with an elastoplast bandage on his head to cover one of the cuts he had received a week earlier. A spirit such as that must inevitably have its effect on morale, and it helped tip the scales in our favour. As John Lyall afterwards remarked " The cheif won his fight" - which followed a jocular remark that Billy had a look of Geronimo when he led out the team. The O's could reasonably consider themselves a little fortunate not to gain a replay, as with a quarter-hour to go it seemed a likely outcome. But four minutes later we took the lead for the second time, and Orient's late endevours just could not close the gap again. Ray Stewart converts another penalty. Ray Stewart again, with the winning shot.